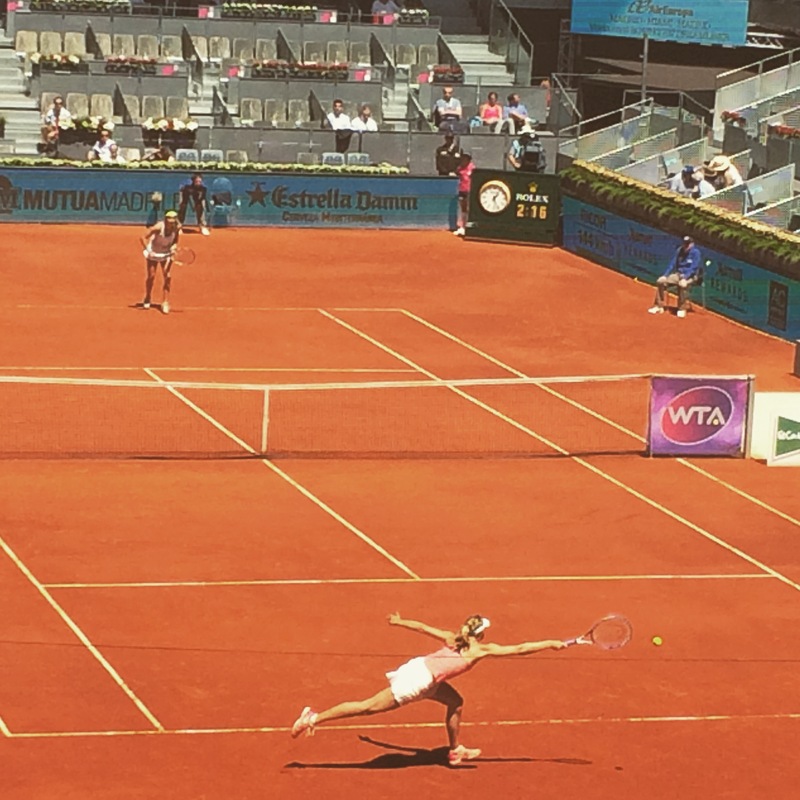 The order of play for Wednesday at the Mutua Madrid Open was just huge: Sharapova. Serena. 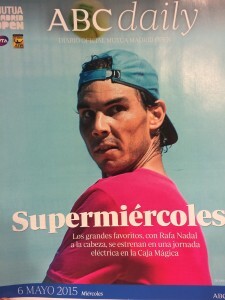 Rafa. Federer. And that was just the day session. I personally love the combined events, even though it seems the WTA matches draw the short straw in terms of the schedule and streaming. But they really do feel like Grand Slam tournaments and today’s lineup was incredible. 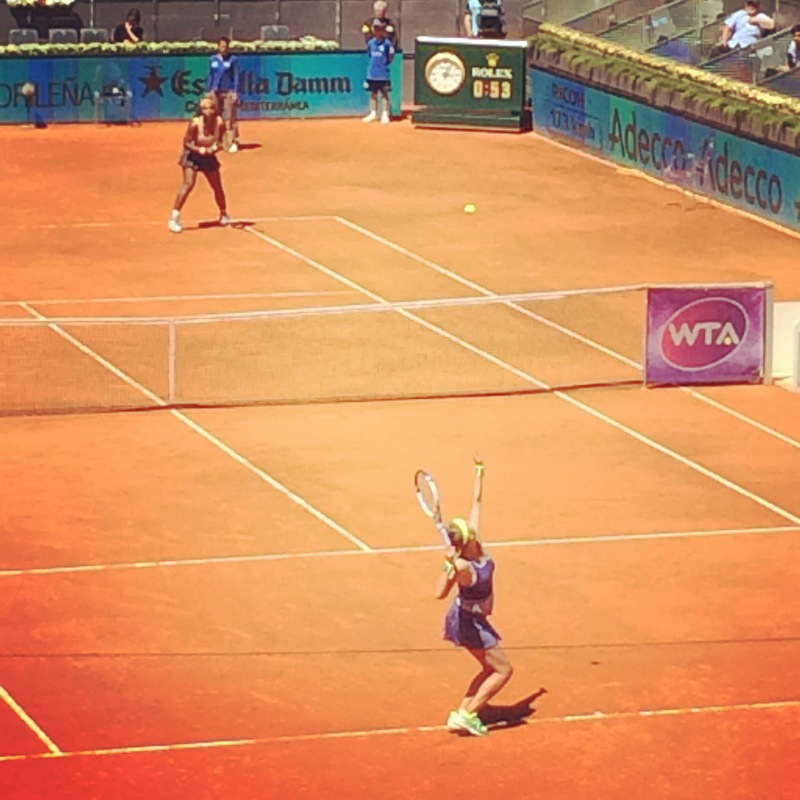 Maria Sharapova and Caroline Garcia kicked off the day session to a pretty sparse crowd. That’s nothing new – many tournaments have trouble filling a stadium for the first match of the day on a weekday. And it didn’t appear that the masses were missing much as Sharapova won the first set 6-2 in pretty tame fashion. 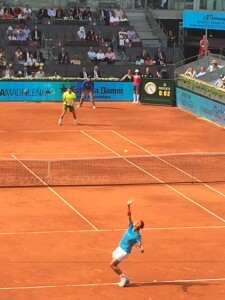 Her flat groundstrokes were pinning Garcia to the baseline and the Frenchwoman’s attempts to stay in the point fell short as the two-time French Open champion pounced on any short ball. Sharapova broke to go up 3-2 and won the next three games. Garcia struggled on her serve, tossing in four double faults in that first set alone. But in set two, Garcia started to get some openings to break and she went up 4-2 only to be broken back at love the next game. Still, that break seemed to give Garcia hope that she could find her way into the match, and all of a sudden she won the second set and we were going three. The third set was intense. Both had chances to break but it was Sharapova who grabbed her chance at 5-5, and she served out the win in 2 hours, 34 minutes to advance to the quarterfinals. Question: I would like to know if you enjoy playing your matches, or is it just hard and serious work that can’t be enjoyed? In Thursday’s opening match on Manolo Santana court, Sharapova will face Caroline Wozniacki, who beat her good mate Agnieszka Radwanska pretty handily, 6-3, 6-2. I didn’t see any of that match, but honestly how amazing is Woz’s turnaround on clay this year? She barely won matches on the red clay in either 2013 or 2014, and this year alone she made the finals in Stuttgart (and was two points from the title) and now she’s into the quarters of Madrid for the first time since 2009, when she lost the final to Dinara Safina. 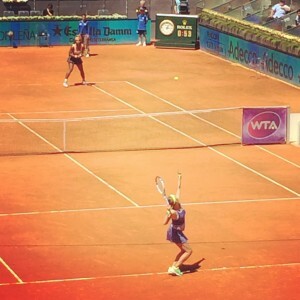 Sharapova has lost her last two matches to Wozniacki, so it’ll be interesting to see how they match up on clay. 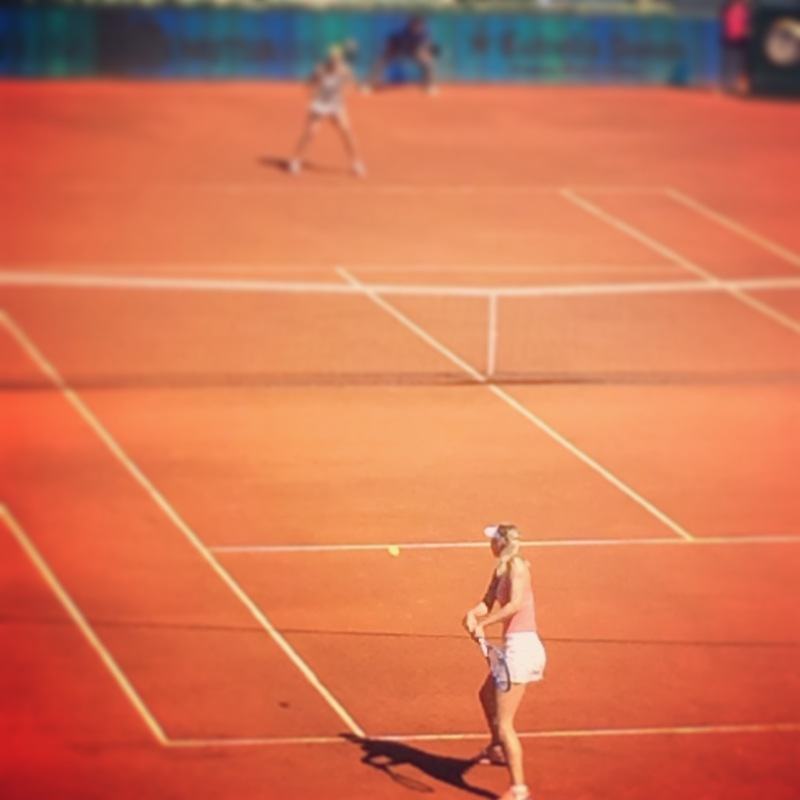 Sharapova has won both their previous matches on the red dirt. After Sharapova’s win, it was time for the match I was most excited about: Serena Williams and Victoria Azarenka. These two have had some fantastic matches, and although Serena lead that head to head 14-3 going into today’s match there was much intrigue specifically around Sascha Bajin. Bajin was on Team Serena for eight years as her hitting partner (as well as roommate, general errand boy and confidante), and she spoke fondly about him, stating once that after her parents he was the one she was closest to. Something went down this year, and it was announced in March that Bajin had split and that he was joining Azarenka’s team. We don’t know what happened, although Twitter tells us Serena and Sascha stopped following each other so it must not be too amicable. Either way, this match had an extra layer of intrigue with Sascha in Vika’s box. Certainly Sascha would have given his new boss some good tactics about playing Serena – would she be able to end Serena’s 25-match winning streak? It certainly looked likely as the two battled through the first set. We didn’t see a single break point all set, and it went to a tiebreak. Vika surged ahead 4-1 after a Serena forehand sailed long and she thew in two other errors. When Vika hit an ace to lead 5-1, it seemed Serena would have to come from behind a set to keep her title hopes going. But…plot twist! Serena cracked a return winner and Vika missed a few returns and threw in a double fault and all of a sudden it was 5-5. Serena would win 6 straight points to somehow take that set, 7-6 (5). No matter how many times I’ve watched Serena you just know it’s never over til it’s over. She’s just never out of striking distance of pulling out games, sets and matches. This match was not the tidiest. And to me it felt like Vika was serving great, but everything else was on Serena’s racket. She’d hit a winner or an error. The world #1 broke serve to go up 3-2 in the second set and it felt like that was going to be the match. But then Vika won four straight games and again the crowd in La Caja Magica was treated to a third set. Serena raced to a 3-0 lead in the decider and I thought a bagel set might happen. But all of a sudden, it was 3-3 and who knew how this roller coaster match would end. At this stage of the match, Serena had hit 41 winners and 41 errors, while Vika had 16 winners and 31 errors. I mean, not great numbers but these women are aggressive and they go for their shots. 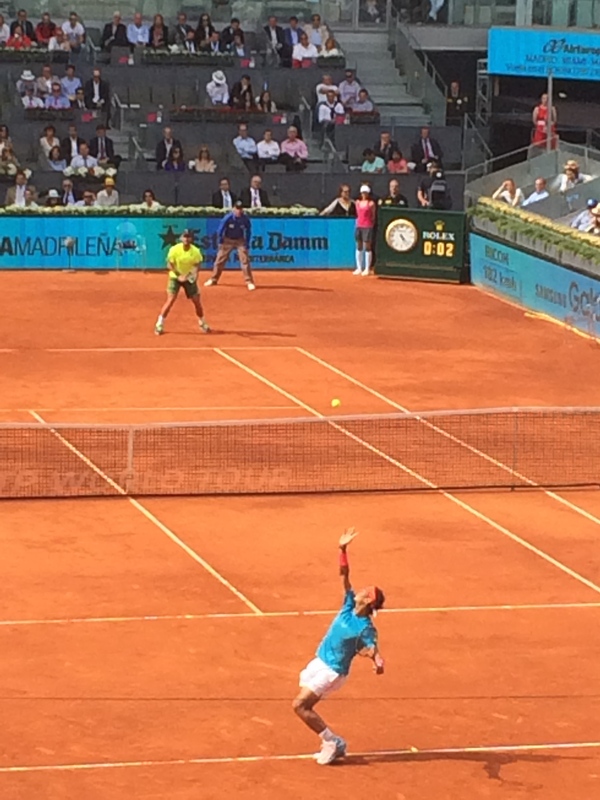 Vika served at 4-5 to stay in the match and Serena got to a match point but drove a backhand long. 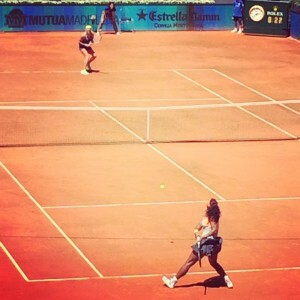 At 5-5, Serena hit a double fault and hit two forehands long to help hand over a break and Vika served for the match. Vika went up 40-0, with the help of a few Williams shots into the net and all of a sudden it looked like Vika was going to pull the upset. But no, Serena ripped a forehand winner and hit a backhand return Vika couldn’t get back over the net to fight off the first two match points. Then, Vika thought she hit an ace, but it was overruled by Chair Umpire Marija Cicak. What followed were five straight faults and all of a sudden we were in a third-set tiebreak. Serena raced to a 6-1 lead this time and there would be no letting up as she closed out a 7-6 (5), 3-6, 7-6 (1) win for her 26th match win in a row. What an incredible match, but was it all about Vika choking while serving for the match? That seemed to be the opinion of many on my Twitter timeline, but honestly I didn’t see it that way. 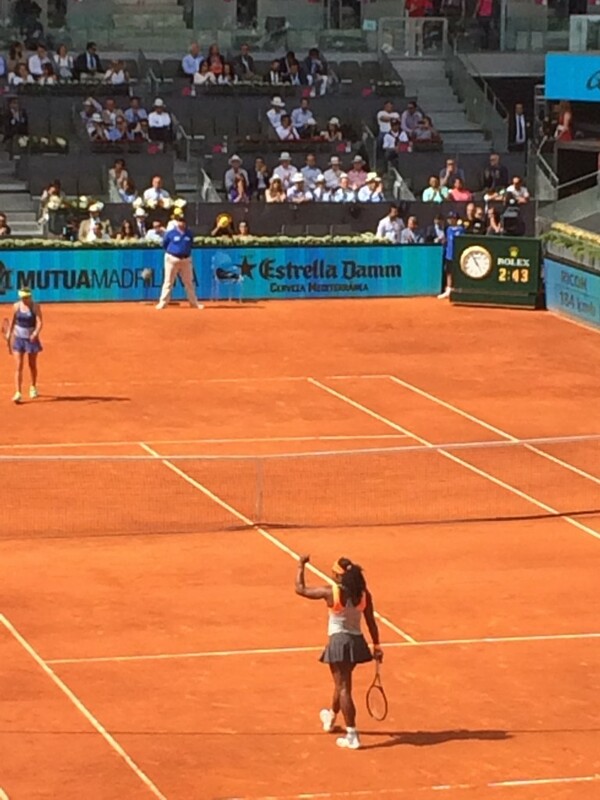 Serena was handing Vika plenty of errors (53 total) and the break at 5-5 in the third set was a gift. I feel like I need to rewatch this match again when I have another 2 hours and 43 minutes to spare. Sometimes the quality seems worse when you’re watching live and are feeling the emotions of it all, so I like to rewatch matches to relive it and see how it all unfolded (plus you miss all the closeups and reactions when you’re in a stadium). I can’t wait to see this one again. Serena sounded like the rest of us though when asked for her impression of the match during her press conference. Her response: “I could have won; she could have won. I really ended up winning, and I don’t know how. Yeah, I feel like it was intense.” The world #1 faces Spaniard Carla Suarez-Navarro, who has eaten bagel sets in half the sets they’ve played, in quarterfinal action tomorrow. By the time the court was watered and prepared for the third match of the day, the Manolo Santana Stadium was pretty full. Let me say this. 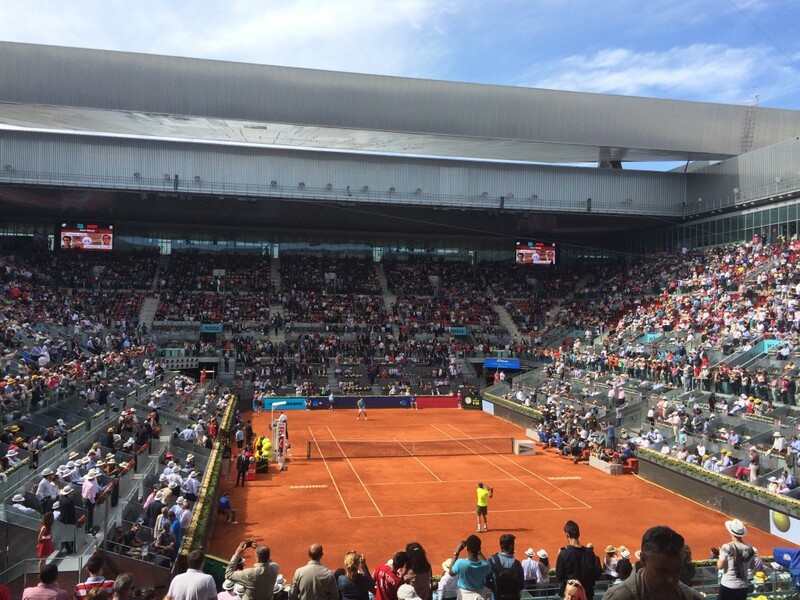 I do not detest La Caja Magica but the way the lower boxes are designed make it hard to see on TV if anyone is actually present in those metal cages in the stadium court. I have spent some time this week trying to correct the notion that no one is in the stadium – it’s just strangely designed and actually there are many more seats in it than I thought (12,442 total). Look – people in the stands in Madrid! When Rafa Nadal and Steve Johnson stepped on the court, the stadium was rocking and it was fun to see (and hear) the Spanish crowd welcome Rafa. I had been in my seat for about 4 hours by this stage so I went for a break midway through the first set so I can’t give much of a match analysis. I didn’t think Rafa was going to be challenged much by Johnson and when he broke to go up 4-2 in the first set I figured I was safe leaving for awhile. He won the match pretty handily (and quickly for his standards), 6-4, 6-3 and will face Italian Simone Bolelli in the next round. Wednesday’s night session actually began after 10pm and it will be Thursday when Andy Murray and Philipp Kohlschreiber take the court as Sam Stosur and Svetlana Kuznetsova didn’t wrap their match up until 12.55am. The Russian earned her way into the quarters with a 5-7, 6-2, 7-6 (5) win in 2 hours, 43 minutes and she plays Lucie Safarova on Thursday for a spot in the semifinals. The other women’s quarterfinal features Petra Kvitova and Irina-Camelia Begu. The full order of play for Thursday can be found here. whoops, cut myself off. Can you PLEASE tell me when the Madrid women’s final is? I can’t seem to find it on their website or anywhere else. Fingers crossed that it’s not Saturday since I have to go to a housewarming out of town! Thank you and shoot! That’s exactly when we’ll be in transit 🙁 Hope you have had a great trip and I’ve enjoyed reading your tweets throughout!